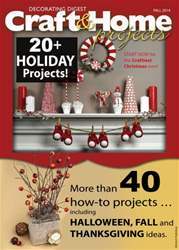 (0 Customer Reviews) | Write Review 4 issues per year Decorating Digest - Craft & Home Projects - An all-around craft magazine, is packed with contemporary and timely projects in a wide range of mediums. Clear color photos and user-friendly step-by-step instructions are geared for the novice or beginner. The resource guide provides readers access to supplies. Start NOW for the Craftiest Christmas ever! Including Halloween, Fall and Thanksgiving ideas. Decorating Digest - Craft & Home Projects - An all-around craft magazine, is packed with contemporary and timely projects in a wide range of mediums. Clear color photos and user-friendly step-by-step instructions are geared for the novice or beginner. The resource guide provides readers access to supplies. 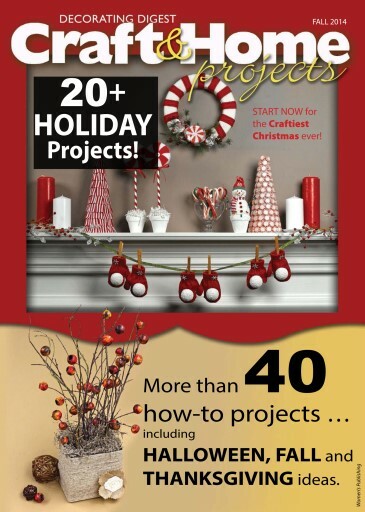 You'll receive 4 issues during a 1 year Craft & Home Projects magazine subscription. You'll receive 4 issues during a 1 year Craft & Home Projects magazine print subscription.